Tutorial: How to sample your Reverb Units to use them in Convolution Reverbs. Before you haul all of your gear out into the world and attempt to sample real spaces, it is worthwhile to make a few Impulses of reverbs you have in your studio. I’m aware that convolution reverbs take WAY more CPU than your average reverb unit, but I do think it’s important to follow this guide to really get the process down. By doing this you can demystify convolution reverb sampling and have a better understanding of how it all works before wasting a lot of time sampling real spaces. To do this you only need a few things. Really, it is a pretty simple thing to do. Let’s get down to business! List of gear you need to sample a Reverb unit. 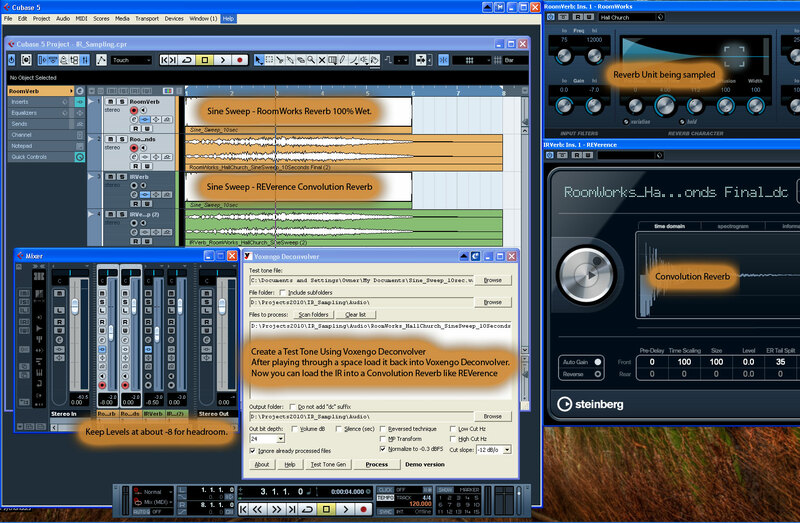 I”ll be using REVerence which comes free with Cubase 5. Hardware or Software Reverb unit. DeConvolver to decode the recorded signal. Voxengo DeConvolver – This program is free to try and awesome. It can generate your sine sweep impulses and DeConvolve sampled spaces so you can put the IRs into your Convolution Reverb Unit. Once you have the necessary components you can follow these steps to sample a reverb unit. Run Voxengo DeConvolver. 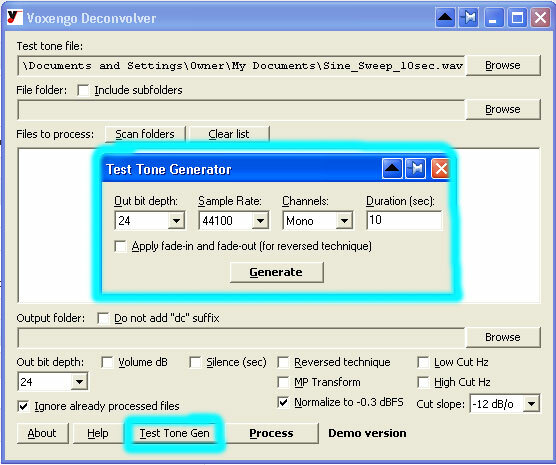 Click the button at the bottom that says Test Tone Gen.
Now load the SineSweep into your DAW of choice. Put the reverb unit you want to sample into the first Plug-in Insert. I used a Hall Church setting that is in RoomVerb from Cubase 5. Any reverb unit will work. Set the reverb unit to 100% wet so it will be entirely outputting a reverb signal. I also recommend turning the volume down to about -8 to allow headroom. Bounce the signal going through your reverb unit. Be sure to set the bounce region to be long enough to keep the reverb tail. I left about 2 seconds for the church hall. Take the bounced signal and import it into Voxengo DeConvolver to DeConvolve the signal. First load your original Sine Sweep test tone file at the top, then load the bounced signal into the program. See the screenshot below for my settings. Click process to generate your very own Impulse Response file! CONGRATULATIONS! 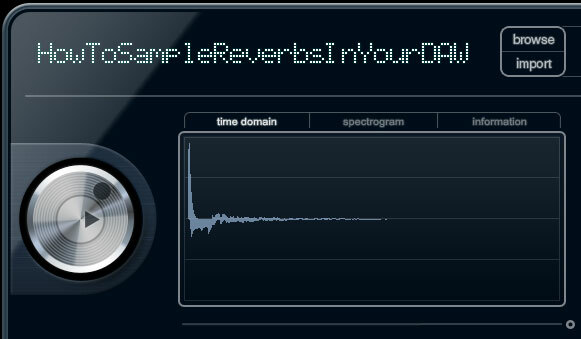 You have just taken the steps to make your very own Impulse Responses for convolution reverbs. That wasn’t so bad was it?? Now make a new track in your DAW with a convolution reverb. Import the IR into your Convolution Reverb and you are ready to hear your sampled room at work. After comparison you can hear that they are almost exactly alike. This process isn’t limited to reverb units! That’s right! You can sample EQs, your favorite filter settings, or really anything you can put as an insert. This is where you can start to get creative. I hope this has demystified the process of sampling reverbs for you all. I also hope you all start to get creative with this process. If you do please take the time to comment and let me know what you’ve come up with. Now that you know how to sample gear, you can use similar steps to sample real world spaces. Stay tuned to the blog for Part 3 where I’ll show details on how to sample an acoustic space using a variety of gear. This is where it will start to get REALLY useful. Loved this. Really broke things down step by step and totally demystified the process. Never thought I’d create do this, but I’m going to give it a shot. Thanks for the inspiration! This is awesome. Thank you so much!!! I will be sampling every single space I’m in, from now on! Hey Lee, I haven’t gotten around to making part 3 yet. I’ve been focusing on some projects over the blog. It’s good to know there is interest in this topic! I’ll have to put it together soon 🙂 Thanks for commenting! I just started working at a studio after being a live sound engineer for 6 years. I’ve done home recording off and on for about 10 years. I’ve wanted to create reverbs from spaces for as long as I’ve known about convolution reverb. There is not as much info on this as I expected. There are some amazing spaces that I’d like to be able to sample, since recording in the spaces would be near impossible, and if possible, cost prohibitive. I’ve the reverb in these spaces is otherworldly, and unlike anything I’ve heard on any recordings. I might experiment with creating some within software, but there are some aspects that I’d like to be able to capture. Hi Aaron Thanks for the article – would love to read part 3 as well. Do these techniques allow you compare the sound of different monitor setups in different rooms? I’m familiar with visually comparing waterfall plots but I wonder whether convolution could serve in any way as an audible equivalent.